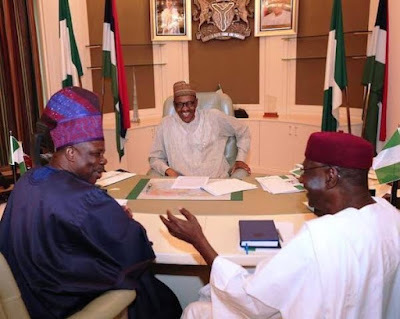 Contrary to claims that President Muhammadu Buhari had “scheduling difficulties” by the Presidency and could not make the planned 2-day visit to Lagos state on Monday, he instead hosted Governor Ibikunle Amosun of Ogun state at the presidential villa. Vice-President Yemi Osinbajo was rather drafted to make the Lagos state visit and has been commissioning projects in the state. Presidential spokesperson, Garba Shehu, had said in a statement on Sunday that “The president is faced with scheduling difficulties and that is the reason for the postponement of the visit. He needs more time for Lagos and for Edo which had earlier been stepped down,” Shehu told state house correspondents on Sunday. “As a result of this, the visit has been scaled down and he is being represented by His Excellency the vice-president, who is going to Lagos to commission a few projects, leaving the rest for Mr. President. “The president will undertake these visits after the Ramadan.” The Whistler learnt that the suspension of the visit by the president has left many officials of the Lagos state government wondering the reason as preparations were already concluded for the hosting.